The Senate employed one horse and one wagon to carry all of its mail. Pages maintained the candles lighting members' desks during night sessions. House roll call votes performed by hand averaged 45 minutes. More than 1 million emails were sent to senators — in one month from members of one group about one issue. Long-lasting, energy-efficient LED lighting provides bright, even illumination around the clock without the heat of traditional lighting, cutting air conditioning and electrical costs. Most House votes are electronic and last only 15 minutes, an approximate annual savings of 90 hours. 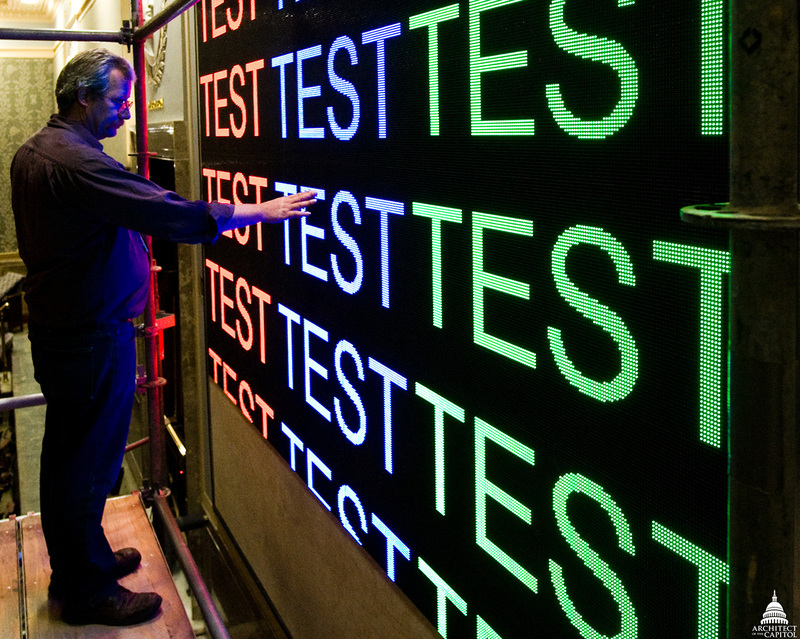 Testing the House Chamber Voting Display Board after installation in 2011. One technology made these remarkable advances possible — ELECTRICITY. The Capitol campus continuously consumes high-voltage electricity, with each building being fed by up to four 15,000 volt cables, known as feeders. All of this power is managed by the high-voltage electricians of the Architect of the Capitol (AOC), who perform maintenance to prevent electrical outages. Each feeder carries enough current that if anyone were to get too close, the electricity in the feeders could arc through the air like a lightning bolt and strike them. "I've seen what electricity can do to a person, so I respect it," said Keith Degay, High-Voltage Electrician Supervisor, who moves and gestures with a precise military bearing. After almost 20 years working with high-voltage, which requires following safety procedures exactly, precision has become second nature to him. It wasn't always this way, of course. Originally, artificial light was provided in the U.S. Capitol by flame, fueled first by whale oil, then by natural gas, which had its own dangers. Shortly after Edison patented the incandescent lightbulb, the then-Architect of the Capitol, Edward Clark, found that gas leaks were killing shrubs planted by Frederick Law Olmsted as part of his landscape redesign for the U.S. Capitol Grounds. Clark promised to investigate electrical lighting. 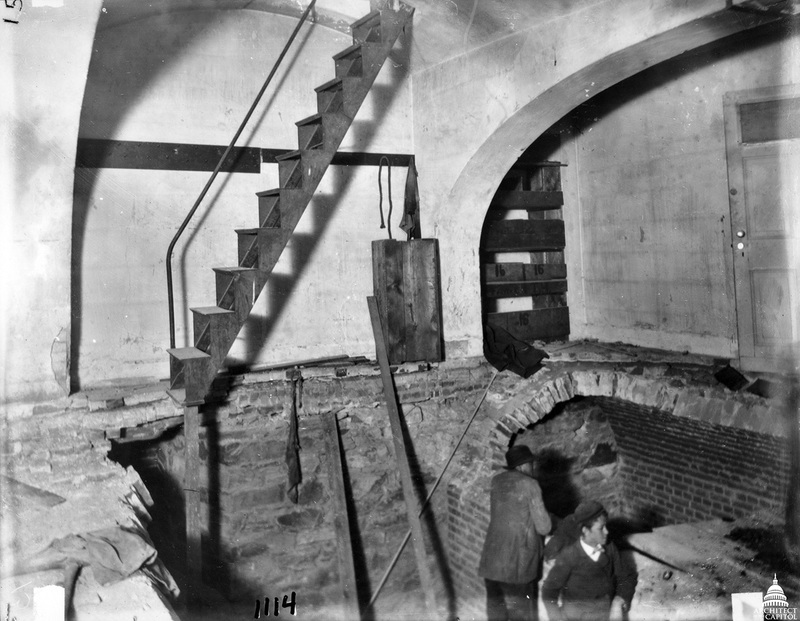 The exposed cellar of the small Senate rotunda after the 1898 explosion. Gas also presented greater dangers. On the evening of November 6, 1898, U.S. Capitol Police Lieutenant Robert S. Akers was knocked out of his chair by a gas explosion that tore open the floor of the small Senate rotunda. Windows were blown out throughout the Senate wing of the U.S. Capitol. A natural gas fire raged in the cellar below, and scattered small fires threatened to climb into the ceiling, a tinderbox of dry wood. Fortunately, vigilant firefighters averted this disaster. Ironically, by that time, following successful experiments in the mid-1880s, thousands of electric lights had been installed throughout the U.S. Capitol, and Clark had built a power plant to support them. It had been impossible, however, for him to remove all gas lights, due to suspicions of the new technology and fear of electrical shocks. The explosion reminded people of the dangers of gas and, during this period of conversion, alluring new uses for this revolutionary energy source were being discovered, making possible advances in communications, conveyance and cooling. One could say that the first text message ever sent emanated from the electrified U.S. Capitol when Samuel Morse tapped out, "What hath God wrought?" in his first telegraph message, sent from the chamber of the U.S. Supreme Court, which was still housed in the U.S. Capitol. The message went to Baltimore, and the immediate reply was a harbinger of the information age and 24-hour news cycle, "What is the news from Washington?" 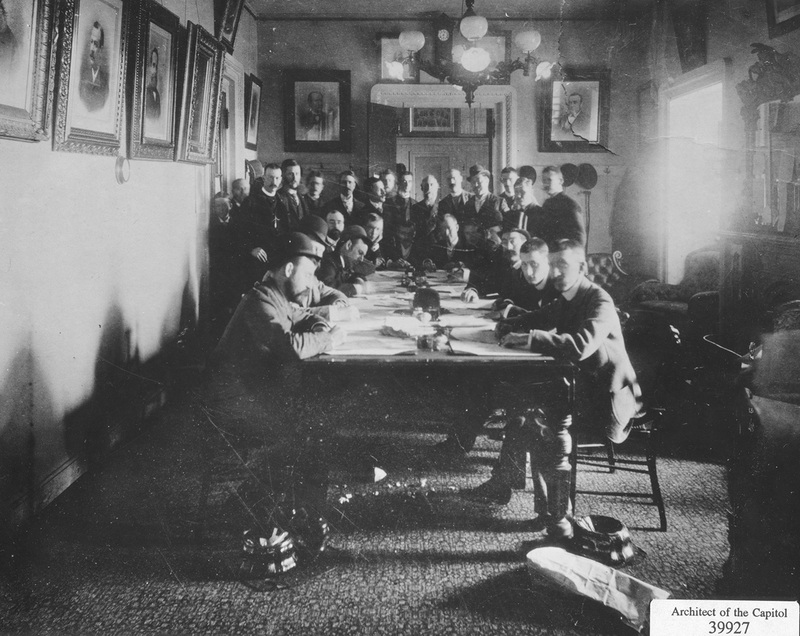 Members of the press work below a chandelier with both gas and electric lamps circa 1895. As wires conveyed the latest developments, cables connected to electric motors carried members of Congress to and from their chambers in newly installed elevators and on a subway from the new Senate office building (now known as the Russell Senate Office Building) to the U.S. Capitol for debates and votes. A few years later, as Congress worked through a long, hot summer, electric fans made their debut in the U.S. Capitol to circulate the air chilled by blocks of ice held on 1,000 feet of rough boards purchased for that purpose. With the advent of air conditioning in the 1930s, the Capitol Power Plant started supplying chilled water to cool buildings on the Capitol campus. While the power plant no longer generates electricity, it continues to provide chilled water and steam to cool and heat 23 facilities, including the U.S. Capitol, the Library of Congress and the Supreme Court of the United States. The local utility provides electricity to those buildings, at which point the high-voltage electricians ensure it is distributed into the buildings. To keep the lights on, AOC electricians must regularly turn off each of the 15,000 feeders one at a time to perform preventive maintenance. Because the other feeders continue to carry electricity, this process requires the electricians to follow precise procedures and wear heavy-duty personal protective equipment (PPE). "We start with heavy rubber gloves that are rated at 15,000 volts," Degay explains. "We cover those with leather gauntlets, which are just to protect the rubber gloves. Then we put on our 40 cal arc flash suit, which is head-to-toe, with a hood that has face shields. All of that is fireproof." 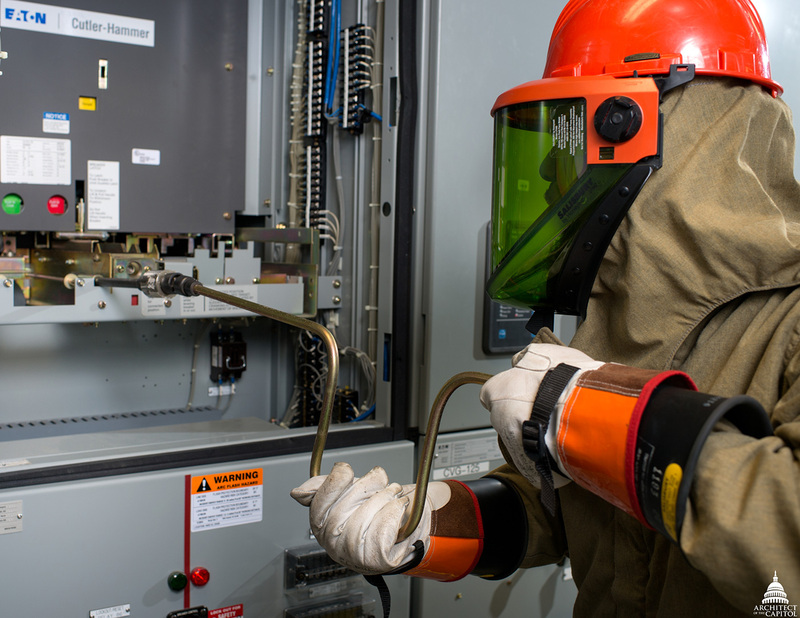 High-voltage electrician Da'suan Mason follows precise procedures and wears a fireproof 40 cal arc flash suit while performing regular preventive maintenance on a 15,000 volt circuit. It’s more than just fireproof, and for good reason. The 40 cal rating means the suit will protect against a blast producing 40 calories per square centimeter. It only takes 1.2 calories/cm2 to produce a second-degree burn, and 4 calories/cm2 will ignite a cotton shirt. If a feeder were to arc, it would create an arc flash, generating blinding light, deafening noises and temperatures of 35,000 degrees Fahrenheit that would vaporize the metal conductors, explosively blasting the superheated metal shrapnel outward in a supersonic shock wave. With all their PPE on, the high-voltage electricians must first shut off the feeder by opening a breaker, which is like a circuit breaker in your house, only much larger. And, the amount of current carried by the feeders requires electricians to switch them off from a safe distance. When the feeder is off, a piece of equipment called a network protector ensures that occupants see no interruption in service by distributing the current from the redundant feeders supplying the building. When the breaker is off, it must be cranked out of its case, along with any sub-breakers, to a safe position, where the high-voltage electricians verify contact resistance, perform cleaning and use a purposedesigned cabinet to test the vacuum bottles inside the relay. In addition to this relay maintenance, they also test and maintain those network protectors that automatically switch to redundant supplies while they maintain the feeders. Those protectors are in place to ensure there is no loss of electricity in the building if there is a power surge, such as from a lightning strike or a utility outage. Berry Russom, High-Voltage Electrician Leader, works on a streetlight. Switching to high-efficiency lamps across the campus is one way the AOC has reduced energy consumption by 30 percent within 10 years. Outside the buildings, the high-voltage crew keeps the lights on, literally. They are responsible for all the streetlights, parking lot lights and park lights across the campus, which is why a second shift monitors those areas at night. Additionally, during all outdoor events like Inaugurations, the Papal visit and the annual West Front concerts, they provide the power for security facilities, lights, sound systems, medical tents, television cameras and more. 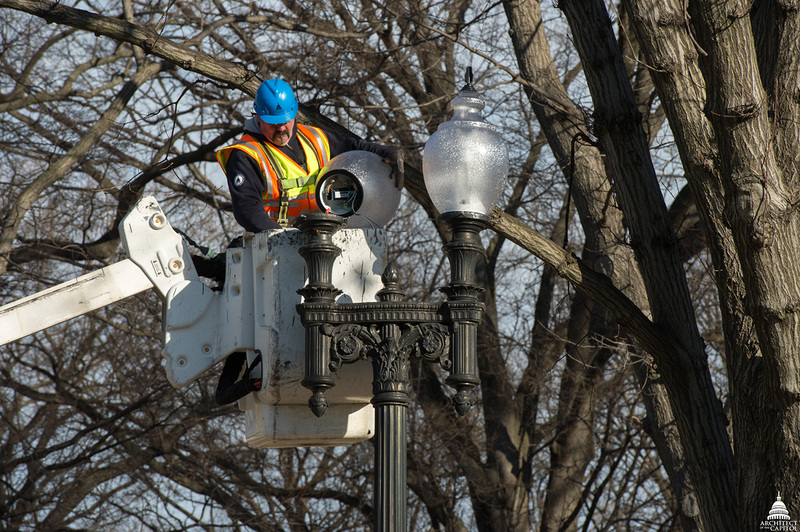 We can't picture living without electricity, and the high-voltage electricians of the AOC work tirelessly to ensure we never see that day on the Capitol campus. Electricity makes it possible for Congress and the Supreme Court to serve the nation. The U.S. Capitol Christmas tree illuminates the West Front. Electricity propels the subways, escalators and elevators they use to get to and from their offices; powers the computers, phones and tablets they use to connect to citizens; and even heats the coffee they sip to stay warm working through winter nights. 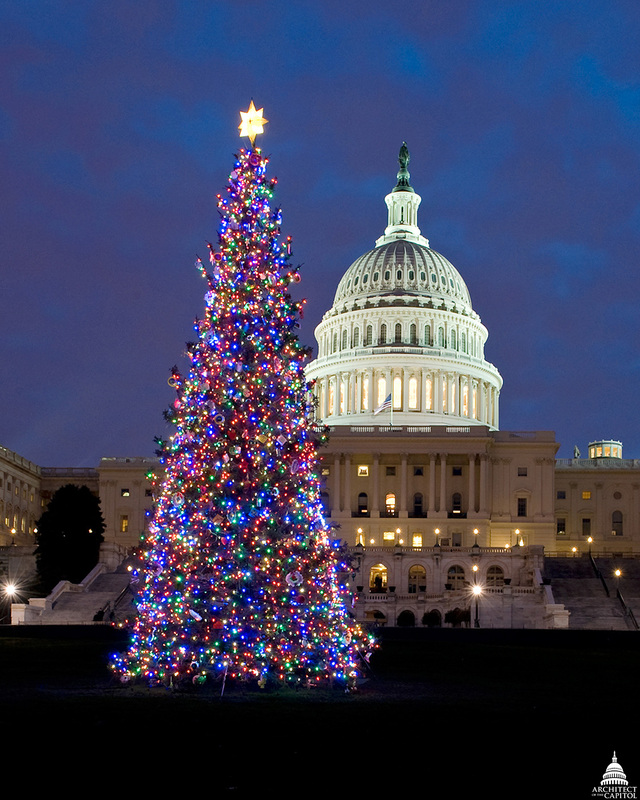 And, in the instant when the Speaker of the House flips a switch and 5,600 bulbs on the U.S. Capitol Christmas tree flash to life, bringing light to the dark December night, electricity illuminates and inspires us all. Hi Franklin, great article. Interesting how people were suspicious of the new electricity in the 1880s and felt gas was safer. I love the pictures, especially the Voting Display Board. Thank you, Franklin.